Software visualization is a kind of computer art, and in the same time is a science for generating visual representations of different software aspects and of software development process. There are many tools that allow software visualization but we are focusing on some of them. In this paper will be examined in details just four tools: Jeliot 3, SRec, jGrasp and DDD. Visualizations that they produce will be reviewed and analyzed and will be mentioned possible places for their application. Also, will be discussed their advantages and disadvantages that we noticed during their work and examination. STOJANOVA, Aleksandra; STOJKOVIKJ, Natasha; BIKOV, Dusan. Tools for software visualization. 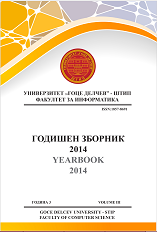 Yearbook - Faculty of Computer Science, [S.l. ], v. 3, n. 3, p. pp. 47-55, may 2015. ISSN 1857- 8691. Available at: <http://js.ugd.edu.mk/index.php/YFCS/article/view/905>. Date accessed: 22 apr. 2019.